A STATUS YELLOW wind warning has been issued for the whole of Ireland tomorrow. Met Éireann has warned that southerly winds will reach mean speeds of 50 to 60km/h with gusts of up to 100km/h. The warning will be valid between midnight tonight and 8am tomorrow morning. 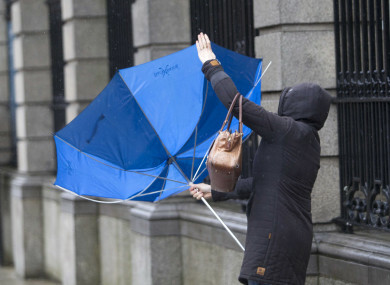 The strongest winds are expected in coastal areas, according to Met Éireann. Temperatures will drop to between -1 and 1 degree Celsius early tonight, causing frost in places. However, temperatures are set to rise later in the night as rain extends eastwards across the country along with the freshening southerly winds. The strong southerly winds will continue into tomorrow, with heavy rain forecast too. The rain will turn to showers in the late morning and afternoon, as the skies brighten up. Highest temperatures during the morning will range between 8 and 11 degrees, however, it will become colder in the afternoon as the winds become westerly in direction. Met Éireann says windy conditions will continue into tomorrow night, as scattered showers continue to affect the west and north. Temperatures will fall again to between -1 and 3 degrees, with some frost. Wintry showers will push into Thursday morning and night, and conditions will become cloudier throughout the day as showers merge into longer spells of rain. Met Éireann has warned of a risk of some sleet on higher ground in northern areas. As is usual in Ireland, the weather tends to change drastically in the blink of an eye. Despite the fact that heavy rain and wind is forecast for the coming days, the Road Safety Authority (RSA) has issued a warning to drivers to be aware of the danger posed by sun glare. Sun glare can result in drivers being temporarily dazzled or blinded by the intensity and brightness of a low sun on the horizon. Ensure your windscreen is clear of grease or grime inside and out. Add windshield washer fluid to the water in the reservoir and check that the wipers are not worn away or damaged. Reduce your speed. Slowing down on the approach of junctions, corners and bends is critical. Be particularly aware of the dangers of sun glare when travelling east in the mornings and west later in the day. Pedestrians, cyclists and motorcyclists are being advised to beware of the dangers that sun glare can cause to drivers, to make sure that the driver can see them at all times, and to be aware of the drivers’ blind spots. Email “Wrap up warm... Heavy rain and gusts of up to 100km/h to hit the country”. Feedback on “Wrap up warm... Heavy rain and gusts of up to 100km/h to hit the country”.